OPPO F1s launched under the term "Selfie Expert" with 16MP front camera. Oppo F1S - Selfie Expert. So yesterday we were at Oppo's launch event where they unveiled the new Oppo F1S, tagged under the term 'Selfie Expert'. While that term is quite interestingly held up by the front camera which boasts a 16MP sensor. 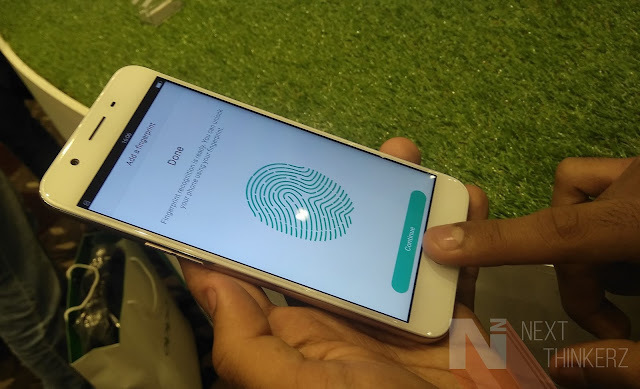 Apart from that, they touted about their fastest 0.22 Secs fingerprint unlock technology & Beautification features with some demos showcased at the event. The event took place in Mumbai with the presence of various folks from Press and business organizations. Whereas from the "F1S" abbreviation, it is pretty much clear that the S resembles Selfie, which is what the phone is primarily marketed for. 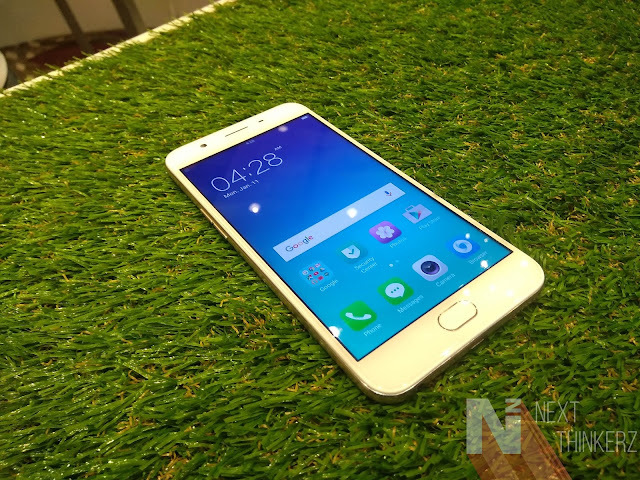 So let's find out more the Oppo F1S in our detailed initial impressions. It comes with a MediaTek MT6750 Octacore Chipset backed by Mali T860 GPU coupled with 3GB RAM. It has a 5.5 inch(1280x720) 2.5D curved TFT IPS Display which is protected by Corning Gorilla Glass 4. It comes with 32GB onboard storage, which supports expansion up to 128GB via a MicroSD card. Then we have a 13MP Rear Camera with a F/2.2 aperture capable of 1080p HD videos at 30fps. Whereas the Front Camera is a 16MP sensor with F/2.0 Aperture. It houses a 3075 mAh Li-Po Non-removable battery. It supports WiFi 802.11 a/b/g/n with 2.4 Ghz & 5Ghz bands; It also comes with Bluetooth 4.0 & usual set of sensors such as Distance Sensor, Light Sensor, G-sensor, E-compass, etc. Whereas it has no NFC connectivity. 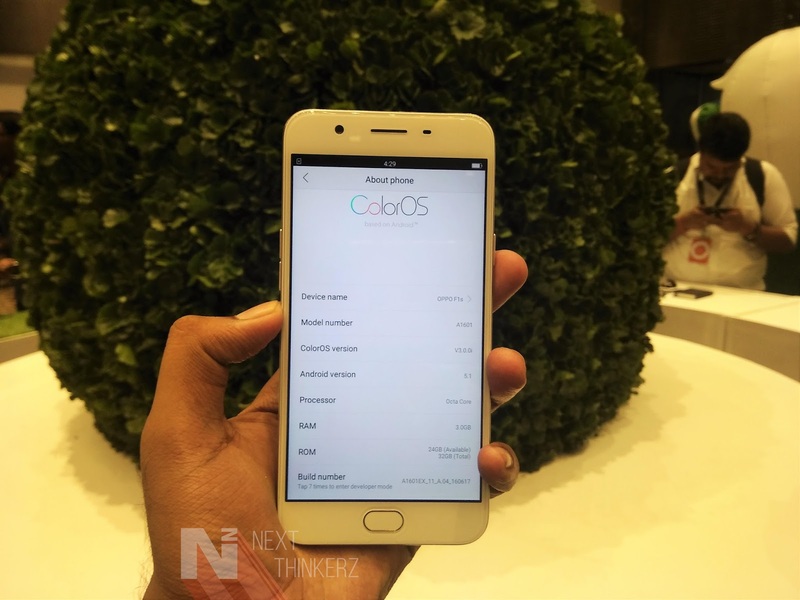 It comes with ColorOS 3.0 build on top of Android 5.1 with no word on marshmallow updates. It comes with 2 Dual SIM Nano slots onboard the Oppo F1S. Dimensions wise, the Oppo F1S has a 154.5 mm height, 76 mm width and 7.38 mm of thickness. It is available in Gold, Rose Gold, Grey colors. Whereas Color variants may differ from your country. You can also use this device while using Gloves, whereas the display can be used with Wet hands. 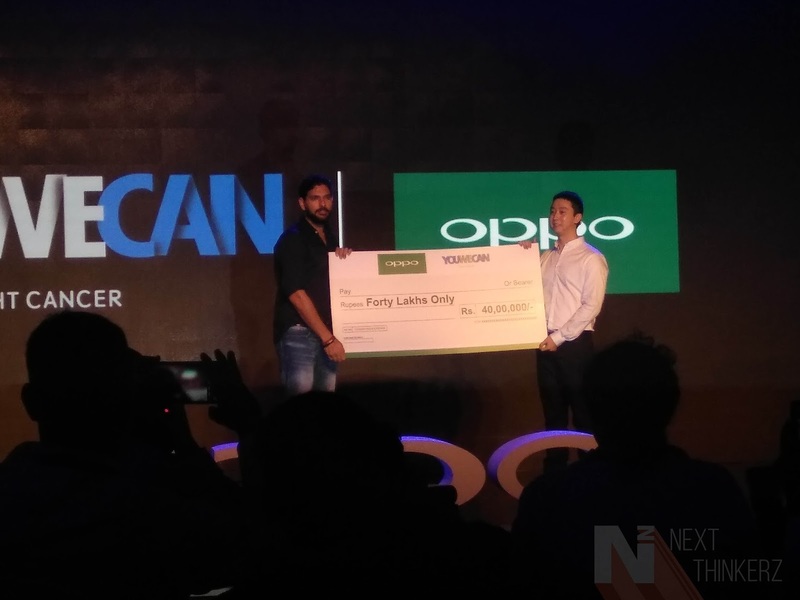 Commenting on the launch, Mr. Sky Li - OPPO Global VP, MD of International Mobile Business & President of OPPO India said, "Being a priority market for OPPO, while we understand Indian consumer’s demand for excellent camera quality & the ongoing selfie craze. OPPO has a rich experience in camera technology & has been the industry leader with several accolades & awards to its credit. Whereas today we are carrying this legacy forward & stepping up the selfie revolution, by launching the new upgraded Selfie Expert – F1s to share advanced photography technology with an even wider range of users in India & also offer them an outstanding photographic experience". The event was also bloomed by the presence of Sonam Kapoor, Yuvraj Singh & Dabboo Ratnani. Oppo placed a cheque with Rs.40 lakhs amount to YouWeCan Foundation, which is managed by Yuvraj Singh. Whereas Dabboo Ratnani took the stage to announce his Nationwide Selfie campaign, which shall commence in August. What does Oppo F1S have to perform better? Now some of us might wonder about that 16MP Front Camera to be superior to the 13MP rear camera. But it's not the numbers game that matters, but the actual camera sensor used, that matters. But again that can be considered as an understatement, As that would theoretically make the front camera(16MP) better than the Rear Camera(13MP). So the Oppo F1S has a 1/3.1 inch sensor which provides a high dynamic range which creates a vivid color reproduction. It stays right, as we did get a chance to play with the device at the event & the pictures look promising with sharp details and little noise present(since we were in indoor lighting conditions). 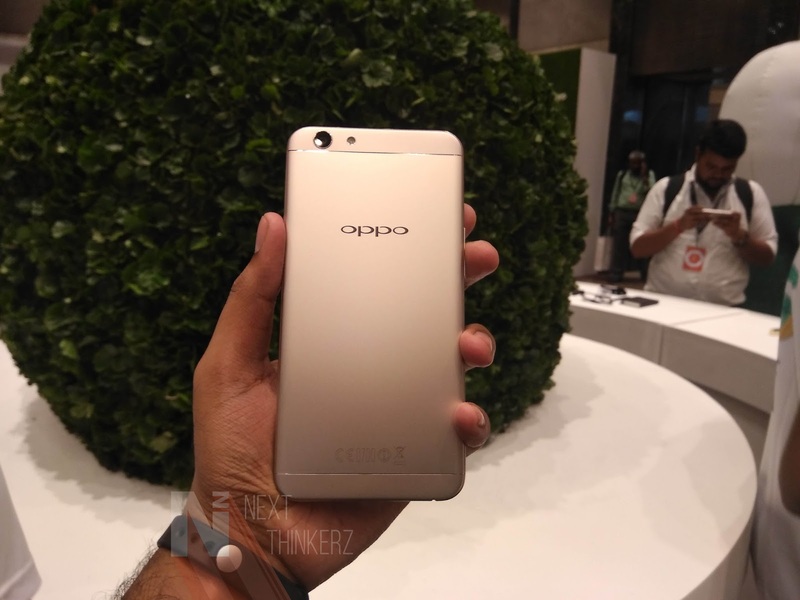 Apart from that the front camera also has the Beautification feature that Oppo did tout about during the event. While to our surprise, it helps in getting bright tones while taking selfies, eliminating all pimples which produces a clear, simplified shot. The current 4.0 version of this app comes with seven different beautify levels, two skins tone modes & has upgraded photo-processing algorithms. This also helps in snapping wider field of view shots taken in the form of Panorama Selfie, which can be triggered by a quick flick of a wrist. It is simple software stitching that goes across, nothing fancy. We also have a Screen Flash which is a prior resemblance of the Apple's Front Flash Technology. We can't speak judge about it in depth, But playing with few photos at the event, the Oppo F1S did seem promising. The Oppo F1S possibly has one the fastest fingerprint unlock mechanism of what I have personally felt about. It unlocks the Phone within prior 0.22 secs; It's wickedly quick. At the event, we compared the Oppo F1S & Oneplus 3's fingerprint sensor, and Surprisingly enough Oppo was the winner here. We've shot a video of it, and it'll be soon uploaded on our YouTube Channel. Apart from the usually unlock thing, Color OS 3.0 also helps you assign five different fingers for opening different apps and functions, Even when the device is in sleep mode. For, e.g: You can directly place a call to a particular contact just by unlocking your device with that specific finger. Oppo also claims that the fingerprint sensing built inside the new fingerprint scanner evolves with time making it faster, As the operating system observes your fingerprint stats via various unlocking patterns. At first glance, it feels as if the entire phone has a metal built, But that's not the real case. The Backplates situated near cameras are made out of plastic, which also goes for the plates located near the chins. Such kind of design helps in giving it a balanced look. This doesn't mean that the phone feels cheap by any means, In fact, I instantly got used to that design & enjoyed my time with Oppo F1S at the event. It felt like a premium build at that price point, and I'm looking forward to playing more with it If the company sends us a review unit. 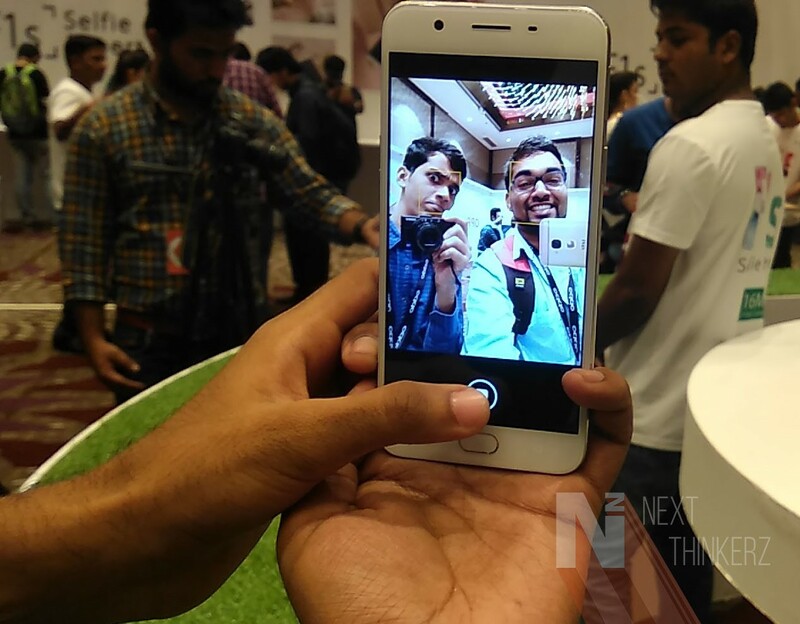 Across the Launch event, the thing that was most pampered was the "Selfie Expert" Camera. Apart from that, the F1S has a Mediatek MT6750 Processor which initially isn't the best processor, when it comes to the competitors offering phones at similar price points. Sometimes the word MediaTek disappoints Geeks big time, But it's not to your liking, but the actual significant processing, memory management, dedicated linguistic processing, Heat management is what defines a Hardware Chipset. Which is what I look for any device, there's no point in coming directly on to the conclusion by the brand name. All of this depends on the actual benchmarks and performance judged upon day to day usage, So I'll keep those words for my final review. Apart from the processor, there's one thing that disappoints me big time, which is the Android Version on this device. It runs on Color OS 3.0 built on top of Android 5.1, Yes that's not a typo. I mean come-on Oppo!, It's like merely a month for the Android Nougat official release, and you're still stuck in old school. At the event, there wasn't any particular time frame given or announced about the updates that would hit this device. The only thing that worries me is the battery life on this device, as Android Lollipop was known for draining battery life to a greater extent. So coming onto Doze Mode would help preserve a prolonged usage, Even though it's equipped with a 3075mAh battery. 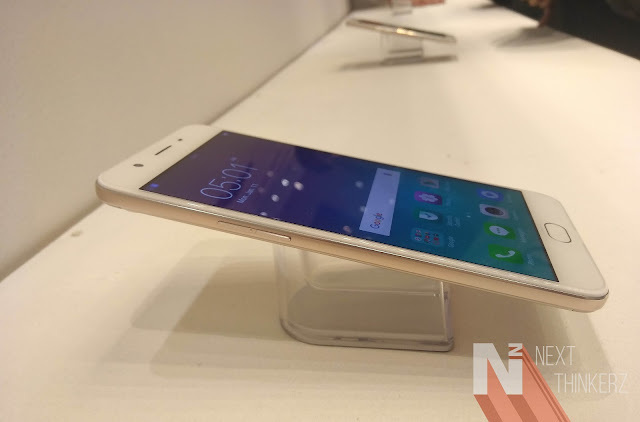 But Oppo claims that you would get up to 14hours of battery life. But I can't say about that in detail since we don't have a review device yet. So initially it is a decent device considering it from a price point perspective, but to be honest, the device feels great, and one wouldn't hesitate to pay the amount of Rs.17,990. At first, the 720p HD display might be a differentiating factor for some, but that shouldn't be a problem unless & until you're a pixel peeper. The Fingerprint Sensor & The Selfie camera stay as the strongest points regarding attraction for the Oppo F1S. The First sale would be starting from 11th August which will be up until 13th August across various cities in India namely Delhi, Mumbai, Bangalore, Kolkata, Trivandrum, Bhopal, Ludhiana, Gurgaon, Vijayawada, Hyderabad, Ghaziabad, and Ahmedabad. The Offline sales are the part which holds up strongly concerning conversion ratio for Oppo. Since competitors are making their sales, Online only. There are still customers here in India who tend to prefer buying a device Offline, because of the general Indian tendency. But don't worry, This device will also be online available exclusively via Amazon starting 11th August 2016. So what are your initial impressions of this device? Would you buy it? If Yes, why? Do let us know in the comments section below. Also See: Boltt to soon introduce Artificial Intelligence in Wearable ecosystem.